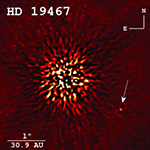 A team of researchers led by Justin R. Crepp, the Freimann Assistant Professor of Physics at the University of Notre Dame, has directly imaged a very rare type of brown dwarf that can serve as a benchmark for studying objects with masses that lie between stars and planets. Their paper on the discovery was published recently in Astrophysical Journal. Astronomers are constantly on the hunt for ever-colder star-like bodies, and two years ago a new class of objects was discovered by researchers using NASA’s WISE space telescope. However, until now no one has known exactly how cool their surfaces really are – some evidence suggested they could be room temperature. A new study shows that while these brown dwarfs, sometimes called failed stars, are indeed the coldest known free-floating celestial bodies, they are warmer than previously thought with temperatures about 250-350 degrees Fahrenheit. To reach such low surface temperatures after cooling for billions of years means that these objects can only have about 5 to 20 times the mass of Jupiter. Unlike the Sun, these objects’ only source of energy is from their gravitational contraction, which depends directly on their mass. Astronomers using NASA’s Spitzer and Hubble space telescopes have probed the stormy atmosphere of a brown dwarf, creating the most detailed “weather map” yet for this class of cool, star-like orbs. The forecast shows wind-driven, planet-sized clouds enshrouding these strange worlds. “With Hubble and Spitzer, we were able to look at different atmospheric layers of a brown dwarf, similar to the way doctors use medical imaging techniques to study the different tissues in your body,” said Daniel Apai, the principal investigator of the research at the University of Arizona in Tucson, who presented the results at the American Astronomical Society meeting Tuesday in Long Beach, Calif.
NASA’s Wide-field Infrared Survey Explorer (WISE) mission has led to a bonanza of newfound supermassive black holes and extreme galaxies called hot DOGs, or dust-obscured galaxies. Now, just as scientists are “meeting and greeting” the new neighbors, WISE has a surprise in store: there are far fewer brown dwarfs around us than predicted.